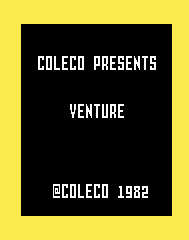 Mattel Intellivision Game published 37 years ago by Coleco Industries, Inc.
Venture © 1982 Coleco Industries, Incorporated. Based on the Exidy arcade video game. In this unique game, you control Winky - the heroic adventurer - who is off on an expedition to claim the treasures that lay hidden in the dungeon. Each treasure is in a chamber - protected by dangerous monsters. He must use his bow and arrow to ward off the monsters and claim the treasures. The more he ventures - the more he gains!